There is no escaping this Justin Bieber character. Turn the TV on, he's there. Read the papers, he's there. Switch the radio on, and oh no, of course, he's there. He's got a movie, too apparently—on 3D, wag ka!—and, and he's here now. As in, Manila Philippines, for a show tonight, May 10 at the SM Mall of Asia open grounds. Cue screaming girls, the most fanatical of whom like to call themselves, ehem, "Beliebers." 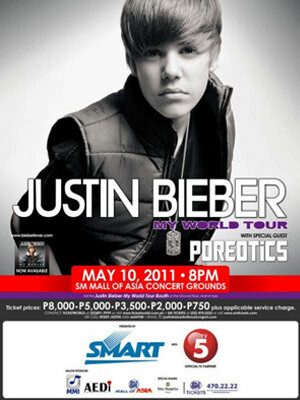 The Philippine Daily Inquirer reports some 25,000 Beliebers are expected to flock to his show tonight. This despite the crazy weather, mind. So to get to the bottom of this Bieber—gulp—fever, FHM investigates. Justin Drew Bieber was born March 1, 1994. That's right, he was born the year Nirvana's Kurt Cobain died (and the year Kanye West lost his virginity, as publicized on Twitter). This makes Bieber 17 years old. He was born in the country that produced the likes of Celine Dion, Avril Lavigne, and Michael Buble. Now before you make those Canadian jokes, remember that Drake and Pamela Anderson also came from the hat of North America. Who do we blame for this Bieber fever? Apart from height and ear-assault factor, Bieber and pocket popster Charice have another thing in common: They were both discovered on YouTube. And contrary to popular belief that he was discovered by Usher, it was actually American Talent Manager Scooter Braun who stumbled upon Justin's videos and was instrumental in getting Justin's then-13-year-old foot at Usher's door. After the boy auditioned and was finally signed to Usher's label (in partnership with Braun), he gets to work and releases his first single "One Time" in the first half to 2009. Call it perfect timing because it was also during that time that Kanye West kept questioning "How could you be so Heartless?" and Lady Gaga was insisting we couldn't read her poker face.